The Black Museum of Scotland Yard is a cabinet of crime curiosities. Founded c. 1874, it contains evidence, contraband, and artifacts ostensibly displayed to help educate new law enforcement officers. The collection includes the above letter allegedly written by Jack the Ripper and sent “from hell”, umbrellas outfitted with secret guns, and the pots (in a kitchen crime scene recreation) that serial killer Dennis Nilsen used to boil his victims. Unfortunately, the Black Museum is closed to the public but that may be changing. 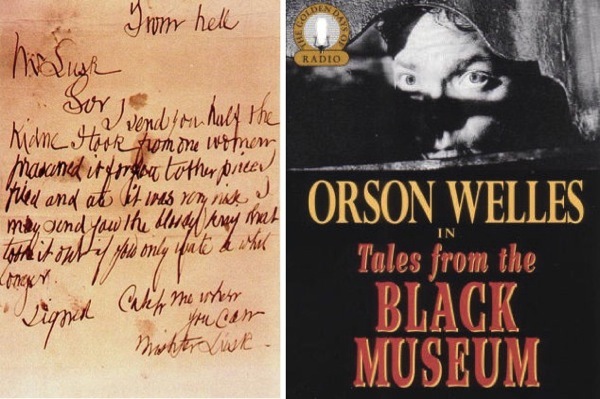 Meanwhile, please enjoy this 1952 radio series hosted by Orson Welles, featuring an item from the museum each episode and a dramatic retelling of the dark tale behind it.